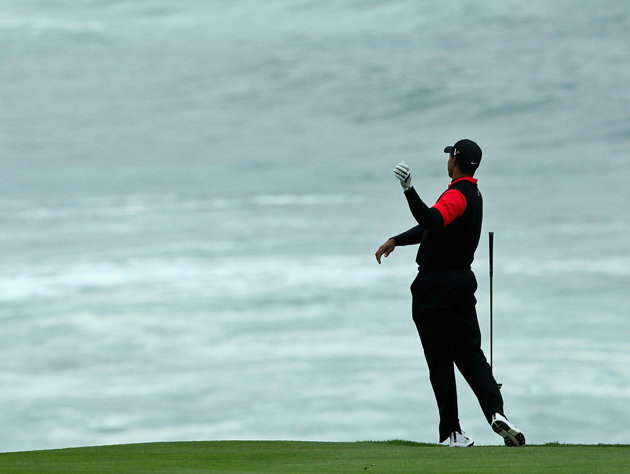 Tiger Woods tends to have a pretty good handle on state of his golf game, but it's safe to say even he didn't see the meltdown coming at Pebble Beach. Less than 24 hours after Woods holed his final putt on the 18th green at Pebble Beach to close out a stellar 5-under 67 in the third round, he showed up for his head-to-head battle with Phil Mickelson with a chance not only beat one of his biggest adversaries, but capture his first official tournament win in more than two years. There was just one problem, however: Woods forget to bring his swing to the course. In one of the most shocking rounds we've seen from him since his first round implosion at the 2011 PGA Championship, Woods completely lost it at Pebble Beach, blowing his tournament hopes to pieces with a final round performance that will certainly have him wondering where it all went wrong. How bad was it? Put it this way: Woods' amateur playing partner, Tony Romo, shot a lower final round score ... and he was playing as a scratch golfer. But that wasn't the only black eye for Woods. He not only lost the tournament to Mickelson -- who was two shots behind Woods when the day started -- but finished the final round with a 3-over 75, which happened to be 11 shots worse than Mickelson's 8-under 64. As CBS analyst Nick Faldo said in the closing holes of the tournament, if Mickelson and Woods were going head-to-head in match play, the match would have ended 7 and 5. Simply put, it was a "Mickelson Massacre". As quickly as the good vibes came in for Woods following three rounds in the 60's this week, they all but disappeared like the surf in Stillwater Cove in a matter of a couple holes on Sunday. Woods looked robotic in the final round, rehearsing his swing over and over again in an attempt to try and find it on the back nine. But it never came back. Hard as it is to believe, Woods went from owning his swing for a majority of the tournament to looking completely lost when it mattered most. We've seen Tiger take two steps forward and three back over the last couple of years as he tried to rebuild his confidence and swing with instructor Sean Foley, but after after watching him fail to make a move during the final round in Abu Dhabi, and melt down on Sunday, you have to wonder what's next for Woods. Based on all the progress he's made over the last few months, it's hard to believe the final rounds struggles are going to turn into a trend (Tiger's made too much progress to make that assumption). But if he gets himself in this position again and fails to produce on Sunday? Well, you should expect the naysayers to come out in full force.